there's gonna be a birthday party! Happy birthday to primatologist, conservationist, and friend of the 'squatch, Dr. Jane Goodall who turns 76 today. Another 76 years with her on the planet wouldn't be enough. As you probably know, she believes sasquatches are real animals based on people she has spoken to. She is a self-proclaimed "romantic" who certainly wants them to be real. This belief is not based on any research she has undertaken. Not everyone has the inclination or time to study the topic, and this is especially true of Dr. Goodall who is on the road tirelessly lecturing over 300 days a year. One of the top three reasons people have a hard time thinking that sasquatches are real animals is that humans underestimate the great apes. 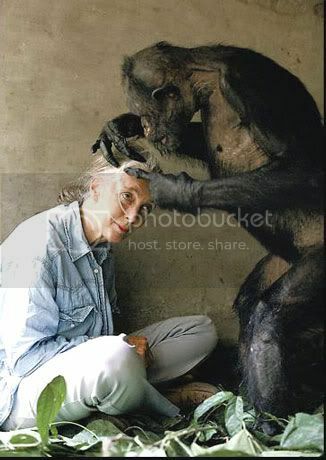 I think it's fair to say that Dr. Goodall does not underestimate apes. She understands the feasibility of how something like the sasquatch could remain unclassified for all this time. Ape behavior is pretty amazing. the secrets still out there. Dr. Goodall founded the Jane Goodall Institute and has successfully protected significant tracts of land for the preservation of apes. (This sounds a lot like the basic premise behind "Conservation Before Discovery.") She has worked to organize Roots and Shoots, a global youth program to empower young people across the planet to make positive changes to the world they live in. We need an army of Jane Goodalls, or people just like her.